Russia-backed militants delivered four precision attacks in eastern Ukraine yesterday. “Unfortunately, one Ukrainian serviceman was killed and one wounded resulting from an explosion of an unidentified device. 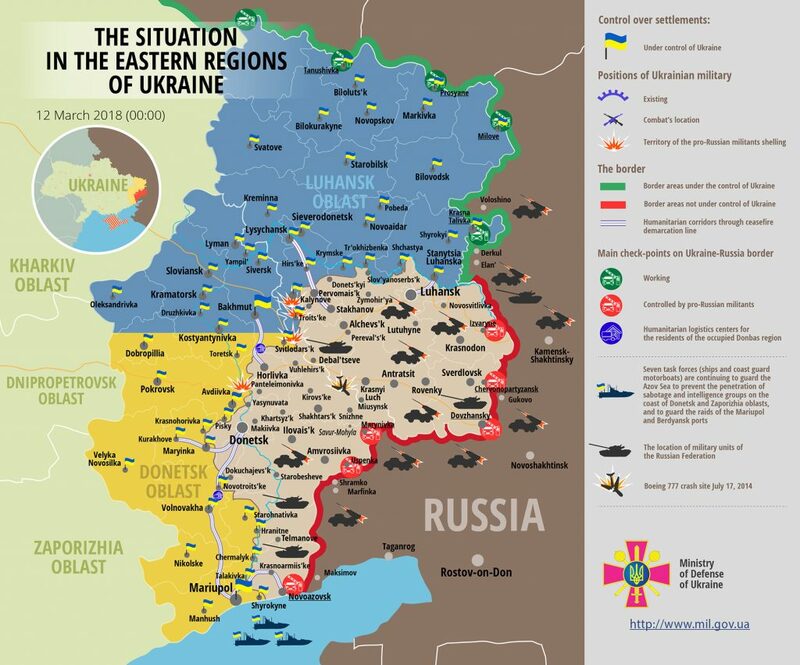 Two more Ukrainian troops were wounded in action,” reported Ukrainian Ministry of Defense spokesman on ATO Dmytro Hutsulyak at a press briefing at Ukraine Crisis Media Center. In Luhansk sector, the militants violated the ceasefire three times. At night, Russian proxies attacked Ukrainian positions near Luhanske and Troitske with grenade launchers and heavy machine guns. After 15:30, Russia-backed militants delivered another attack near Novozvanivka using automatic grenade launchers. In Donetsk sector, Russian proxies attacked Ukrainian troops near Verhniotoretske using small arms and heavy machine guns. Report on the military developments as of March 11 is available here. Interactive data on the shelling: chronology shelling chart and the interactive map.